Joe Mathews is the Irvine senior fellow at the New America Foundation. In the days ahead, you may hear all kinds of explanations for why San Francisco Mayor Gavin Newsom dropped out of the race for governor. Poor fundraising. Poor standing the polls. Internal problems in his campaign. But none of them were decisive. Newsom had only one problem, but it was a problem to which there simply is no solution. That problem is the name Brown. This state has had only three Democratic governors in the past 67 years. Pat Brown. His son Jerry. And Jerry's chief of staff Gray Davis. So when it comes to successful California Democratic gubernatorial candidates, running as a Brown is pretty much a must. Newsom's challenge against Jerry, a popular former governor who was Newsom's only opponent, was a longshot even without the history. But, more than 40 years after Ronald Reagan unceremoniously denied him a third term, Pat Brown has been thoroughly rehabilitated. Simply invoking the name of Jerry's father serves as a shorthand for California's glorious mid-century past of growth and good schools. Jerry, despite having been a very different governor from his father, basks in that reflected nostalgia. Newsom was the only politician in the state to tilt at that windmill. Democrats who don't have the baggage of Newsom (who famously had an affair with his campaign manager's wife) decided not to join the race. State Treasurer Bill Lockyer, who would probably make the best governor of any Democrat in the state, told me plainly for a piece in the September issue of The American Prospect that he wasn't running because there was no way to beat a Brown in a Democratic primary. 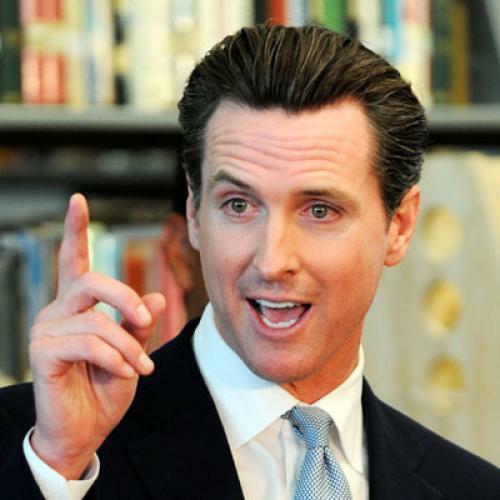 One demonstration of Brown's strength was the timing of Newsom's announcement: He quit on the same day that Brown suffered the first real damaging news of the campaign, a San Francisco Chronicle report that his spokesman was secretly taping interviews with reporters. So, eight months before the polls open, the Democratic primary is over. The only person alive who could beat Brown is the state's most popular politician, U.S. Senator Dianne Feinstein. She has long wanted to be governor, but has given few indications that she'll join the race. And if Feinstein got in, Brown might well get out. The two are friends; Feinstein officiated at Brown's wedding four years ago.